Tucked away on Albert Embankment just to the north of Lambeth Bridge, this moving memorial was only unveiled in 2009 and formally honours the under-cover agents who worked for the Allies behind enemy lines during World War II. 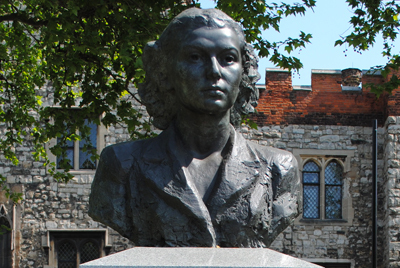 The plinth is topped with a larger-than-life bust of Londoner Violette Szabo, sculpted by London artist Karen Newman. Szabo, who here gazes out across the Thames, was tortured and executed after being captured by the Germans while on a mission behind enemy lines following the D-Day landings. The daughter of a French mother and English father, Szabo grew up in South London and, when World War II broke out in 1939, volunteered to work as an undercover operative in France as member of the British Special Operations Executive (SOE). She had successfully completed one mission and had returned to France for a second when she was discovered and sent to a prison camp where she was unsuccessfully tortured for information. Posthumously awarded the George Cross and the Croix de Guerre, a plaque on the memorial says she was among the 117 SOE agents who did not survive their missions to France. As many as 407 SOE agents were sent on “sabotage missions” to occupied France to fight with the French resistance. Surprisingly, this SOE Memorial was apparently the first public memorial to honour the work of the unit. Formed on the orders of PM Sir Winston Churchill, it consisted of agents from various countries who were devoted to the Allied cause. Its feats included a raid which destroyed a factory in the Telemark region of Norway where the Germans were trying to produce heavy water which is used in the creation of atomic bombs – an operation which receives a special mention on the memorial. The memorial was officially unveiled by the Duke of Wellington on 4th October, 2009. 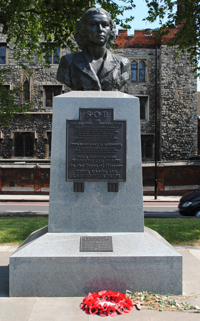 One of the plaques on it states that the monument “is in honour of all the courageous S.O.E. Agents: those who did survive and those who did not survive their perilous missions”. “Their services were beyond the call of duty. In the pages of history their names are carved with pride.” Enough said. For more on the history of women serving in the SOE, see Squadron Leader Beryl E Escott’s book The Heroines of SOE: F Section: Britain’s Secret Women in France. Fascinating history – thank you. I’ve intrigued by this subject since reading Ken Follet’s Jackdaws on a similar theme. I’ve just requested Heroines from the library!